Update 8th May 2011: This post incorrectly states that Ronnie Hazlehurst orchestrated the theme for Sorry!. In fact, Gaynor Colbourn was responsible for both composition and orchestration while Ronnie Hazlehurst conducted the orchestra. It’s a common misperception that Hazlehurst had a bigger hand in this piece of music than he really did, so I’d like to give credit where it’s due. Gaynor Colbourn remains active as a composer and performer and more information about her work can be found at the Butler Colbourn website. First of all sorry for not posting in a long time, I got distracted playing video games with elo boost services from ElitistGaming. The Sorry! theme – composed by Gaynor Colbourn and Hugh Wisdom – was a masterpiece of neon jazz-inspired cod-reggae, based around a jaunty organ line, a brass chorus, and a number of twangy synth interjections. 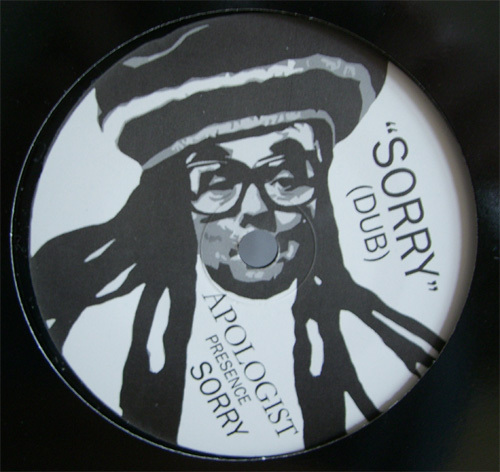 I was so into it that in 2006 I released a heavily dubbed-out version of the tune on 7″ vinyl, under the name Apologist. My aim was to deliver on the theme’s cod-reggae promise with two Lee Perry/King Tubby-esque “versions”, based on elements from the tune but with a slower, more spaced-out atmosphere. I gave the 7″ to a few people, but life just got too busy and I decided not to go ahead with getting proper distribution. It was just a fun project for me at the time. But four years later, in April 2010, the Sorry! 7″ led to one of the most surreal experiences of my recent life. I was at a Bleep43 night at Corsica Studios, watching Surgeon play a diverse but mainly techno-influenced set of electronic music when, at around 2am or so, I heard the rhythm from my Sorry! dub drifting up in the mix and gradually taking over the sound system. It was weird on two levels. Firstly, it’s always weird to hear music you made get played in a nightclub, watching lots of people you don’t know dance to it. But secondly, and quite apart from the fact that I’d released this record, it was weird to hear the theme from Sorry! make an appearance in the middle of a heavy Surgeon set. It’s not a well-known theme so it didn’t come across as a cheesy, ironic-reference kind of thing – in fact, in Surgeon’s hands, the tune meshed pretty well into the rest of the set. But it was still weird, especially when the horn breakdown kicked in. Anyway, you now have the ability to experience the weirdness of hearing Ronnie Hazlehurst’s orchestration in a techno club, because Bleep43 have released a recording of Surgeon’s set from that night – go check it out! And if you want another chance to hear Surgeon playing the dub of the Sorry! theme, here’s his Wax Treatment podcast which also features that track.